She was born Lydia Liliʻu Loloku Walania Wewehi Kamakaʻeha to High Chiefess Analeʻa Keohokālole and High Chief Caesar Kaluaiku Kapaʻakea on September 2, 1838. In her youth she was called “Lydia” or “Liliʻu.” (She was also known as Lydia Kamakaʻeha Pākī, with the chosen royal name of Liliʻuokalani, and her married name was Lydia K. Dominis.) As was the custom, she was hānai (adopted) to Abner Pākī and his wife Laura Kōnia. The Pākīs reared her with their birth daughter, Bernice Pauahi. The two girls developed a close, loving relationship. They attended the Chief’s Children’s School (Royal School,) a boarding school, together, and were known for their studious demeanor. Liliʻu’s brother, David Kalākaua, also was among the royal students educated there. At 24, on September 16, 1862, Liliʻu married John O. Dominis. Dominis’ father, a ship’s captain, had built a New England style home, named Washington Place, for his family. They lived with his widowed mother. The home later served as the former official residence of Hawai‘i’s Governor and today serves as a museum. 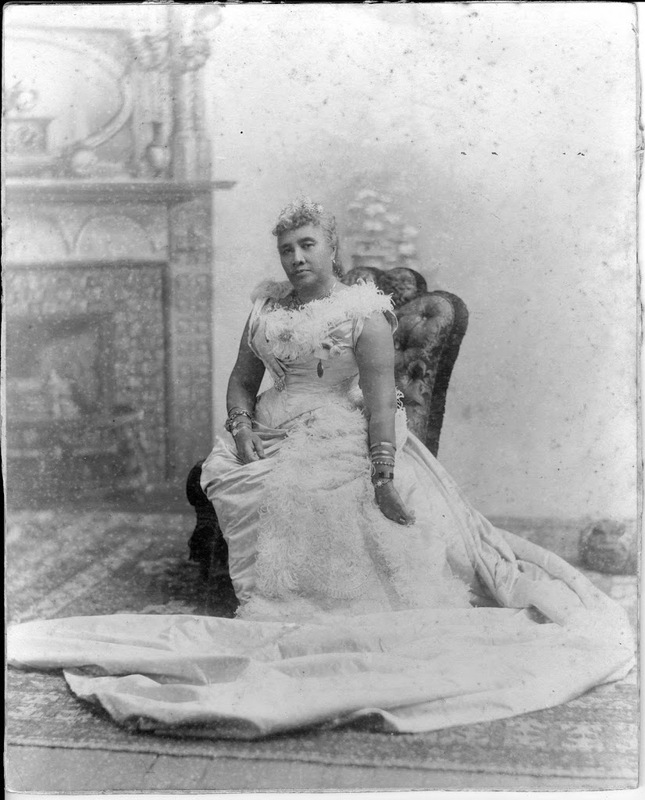 On February 12, 1874, nine days after the passing of King Lunalilo, an election was held between the repeat candidate David Kalākaua (her brother) and Queen Emma – widow of King Kamehameha IV. Kalākaua won. At noon of the tenth day of April, 1877, the booming of the cannon was heard which announced that King Kalākaua had named Liliʻuokalani as heir apparent to the throne of Hawaiʻi. Liliʻu’s brother changed her name when he named her Crown Princess, calling her Liliʻuokalani, “the smarting of the royal one”. From this point on she was referred to as Crown Princess with the name Liliʻuokalani. One of her first acts as Crown Princess was to tour the island of Oʻahu with her husband, sister and brother-in-law. King Kalākaua died on January 20, 1891; because he and his wife Queen Kapiʻolani did not have any children, his sister, Liliʻuokalani succeeded him to the Hawaiian throne. Kalākaua had been a staunch supporter of native Hawaiian civil rights. In part, this led to a rebellion in 1887 forcing him to sign a new constitution relinquishing his powers as head of state and relegated him to a figurehead. Queen Lili‘uokalani sought to amend the constitution to restore some of the power lost during the reign of her brother. Local sugar planters and businessmen feared a loss of revenue and influence and instigated an overthrow. On the afternoon of January 16, 1893, 162 sailors and Marines aboard the USS Boston in Honolulu Harbor came ashore under orders of neutrality. To avoid bloodshed, the Queen yielded her throne on January 17, 1893 and temporarily relinquished her throne to “the superior military forces of the United States”. A provisional government was established. In 1895, Lili‘uokalani was imprisoned for eight months in ʻIolani Palace for her alleged knowledge of a counterrevolutionary attempt by her supporters. On May 18, 1896, at 6:30 am, Lili‘uokalani was baptized and confirmed by Bishop Willis into the Episcopal Church, although she had been a long-time member of Kawaiahaʻo Church. In her Deed of Trust dated December 2, 1909, which was later amended in 1911, Liliʻuokalani entrusted her estate to provide for orphan and destitute children in the Hawaiian Islands, with preference for Hawaiian children. Her legacy is perpetuated through the Queen Liliʻuokalani Children’s Center. Queen Lili‘uokalani died at Washington Place on November 11, 1917, at the age of 79. After a state funeral, her remains were placed in the Royal Mausoleum at Mauna ʻAla. The image shows Queen Liliʻuokalani in 1891. I have added other related images in a folder of like name in the Photos section on my Facebook page. Enjoy reading our posts? Be sure to join us as a subscriber and our posts will be delivered to your inbox. Great post, Peter! By complete coincidence, I was reading her autobiography just this morning. The Queen had so much inherent class in the exemplary way she dealt with the conspirators that she is truly a heroine and a role model. People, places, and events in Hawaiʻi’s past come alive through text and media in “Images of Old Hawaiʻi.” These posts are informal historic summaries presented for personal, non-commercial, and educational purposes. Hoʻokuleana LLC is a Planning and Consulting firm assisting property owners with Land Use Planning efforts, including Environmental Review, Entitlement Process, Permitting, Community Outreach, etc. We are uniquely positioned to assist you in a variety of needs. Get future posts straight to your inbox by subscribing below.